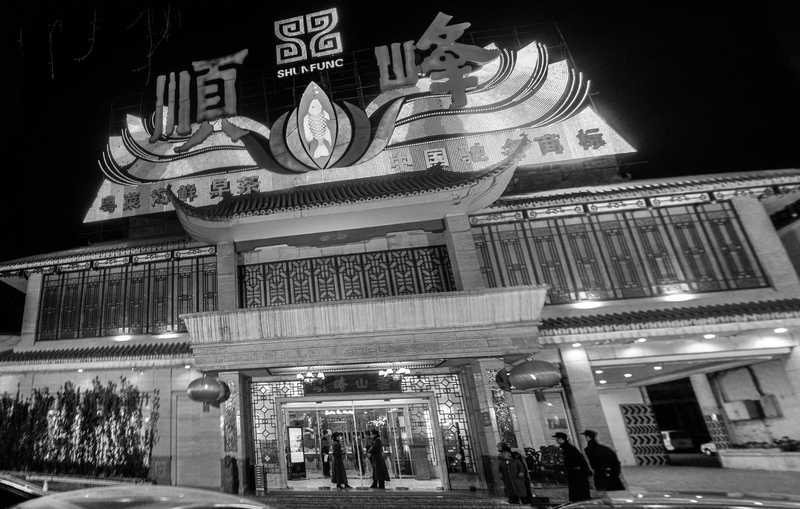 This is the Shun Fung restaurant, which my wife tells me is known for high-quality Cantonese Seafood. She says that it is also very fancy and expensive. I was intrigued by the contrast between the massive neon sign and the little man in the large red coat,bow tie, and black cowboy hat. The photo is a composite nine shots taken with my Canon IXUS 980IS, and stitched together using Adobe Photoshop. In developing the photo, I tried to ensure the blacks were okay, but that one could still see the scaffolding behind the signage as well as the branches in the upper left-hand corner. very interesting. i’m glad you are writing with the photographs. i clicked on your link and read about the cowboy hats and where the concept of “ten gallon” hat derives. also, blew it up as you suggested. a lot of detail indeed. do you have this photo in color too? i am imagining the red coat.